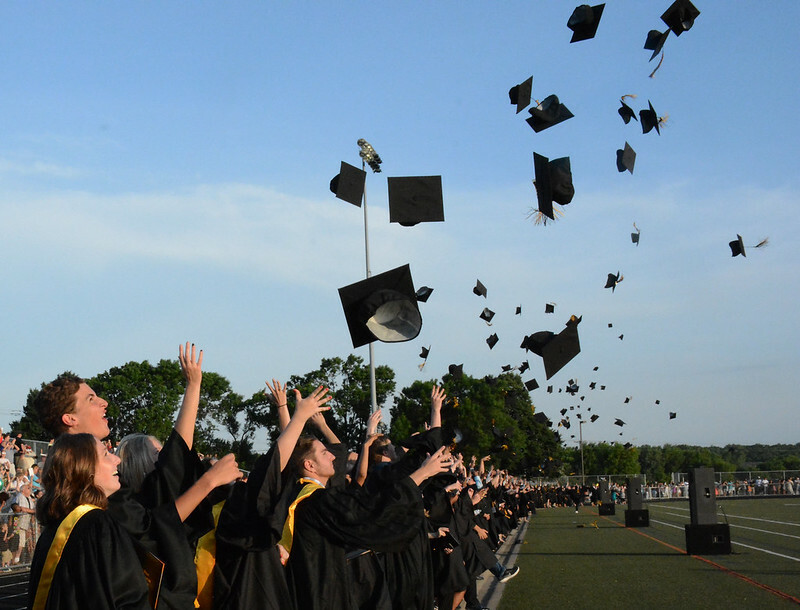 The 605 students in the Burnsville High School Class of 2017 received diplomas in a commencement ceremony at Pates Stadium on June 9. This was the 61st graduating class in Burnsville-Eagan-Savage School District 191 but the first to graduate from a 9-12 Burnsville High School. The school added grade 9 for the first time ever this year through Vision One91, the work to redesign the district to meet needs of today's learners. This senior class was also the first to receive Chromebooks as personal learning devices and the first to benefit from the new Pathways model to better plan and prepare for college and career success. Student speakers at commencement were Gabriella Anderson, Erika Torralba and Olivia Gislason. Musical performers were soloist Abigail Herzog and the trio of Richard Diedrick, Davin McGovern and Adam Arbuckle. The BHS Orchestra, under the direction of Hope Grover, performed and so did the BHS Concert Choir, directed by Martha Helen Schmidt. Valedictorians, students who have earned a perfect 4.0 Grade Point Average (GPA) over six semesters, are Blake Andert, Jack Bardwell, Kyra Bowar, Emma Hakanson, Abigail Herzog, Krista Holmstrom, Katelynn Larson, Marissa Marsolek, Abigail Rhode, Trang Truong, Erin Williams and Jaylin Wong. Salutatorians (with a GPA of 3.992 over six semesters) are Ian Johnson, Kara Odom and Paige Schultz.